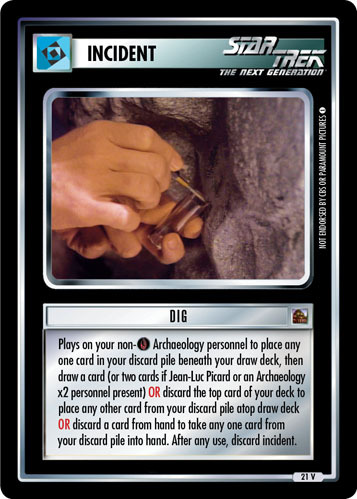 Plays on your non- Archaeology personnel to place any one card in your discard pile beneath your draw deck, then draw a card (or two cards if Jean-Luc Picard or an Archaeology x2 personnel present) OR discard the top card of your deck to place any other card from your discard pile atop draw deck OR discard a card from hand to take any one card from your discard pile into hand. After any use, discard incident. Characteristics: manipulate your discard pile, additional card draws. Card logging info: First edited by Roga Danar at Aug 7th, 2011. One quality log by eberlems at Aug 8th, 2011. Please support openCards and validate game text of this card a second time!